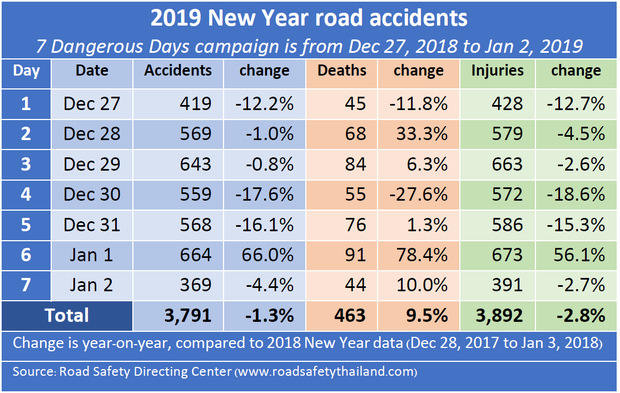 From last Thursday (Dec 27) to yesterday (Jan 2), 3,791 road accidents took place, down 1.3% during the Seven Days campaign last year, while 3,892 were hospitalised, down 2.8%, according to data from the Road Safety Directing Centre today. 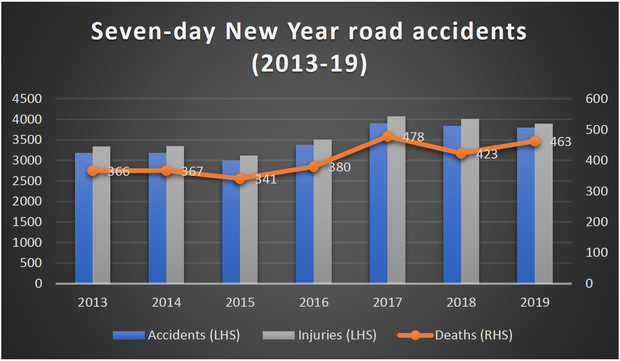 The period, also known as the ‘seven dangerous days’, was designated to promote road safety for travel during New Year holidays. 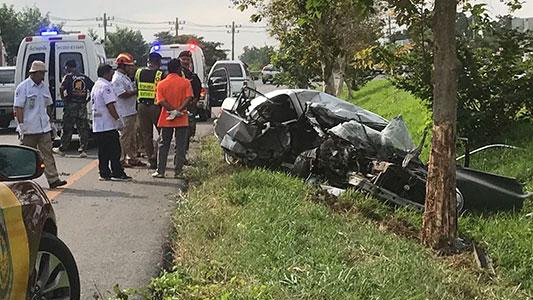 Four provinces reported no road fatalities: Tak, Phrae, Satun and Samut Songkhram. Drink driving remained the major cause (40.4%), followed by speeding (28.3%). Motorcycles were most prone to accidents (80%), followed by pickup trucks (7%) and cars (4.1%). The time of the day when most accidents occurred was 4pm to 8pm (9.3%), followed by noon to 2pm (17.8%). By age group, those aged 50 or more led (24.5%), followed by those between 30-39. Some 1.2 million were prosecuted, up 34.3% from the previous year. The main charges were not wearing helmets, up 27.6% year-on-year to 321,800 cases, followed by driving with a licence, up 21.5% to 290,000. If you can't "fix" it, and no-one actually asks you to, then why [complain] about someone who has an opinion on what could be done. This forum is for peoples thoughts and opinions, otherwise it would not exist. How I would fix it ?? I can't fix it anyway.So why should i waste my time with stupid suggestions. Probably no Thai who could fix it reads this website anyway.And i don't like to stick my nose constantly in this countries  business.That's reserved for those bored people who know everything better but can't live a relaxed life. ...,complaining about other commenter for not giving a solution,but defending only your idol without providing a solution is ok ?. ... please, I, and I suspect many others, would like to know how you would "fix" it, any suggestions appreciated... but hey, no more criticizing those that show some intelligence, and thought, it is o easy to criticize, but seems hard to provide any solutions to the ongoing road carnage. No need to send officials to Singapore for learning.Just contact the serial poster . Just over 3 more months: SongKran! Same-same 7 days of danger 'procedures', including doze/eat  tents sitting along the roads. Nothing will change for the better for make thai roads more safe, lifting it up to at least a +1.0 standard. Send Officials to Singapore to learn there how to do it. Rose 9.5 %. Not 9, not 10, no, just 9.5%. All these 0.2, 0.4, 0.6% etc. are a joke. hahahaha. Sure they have not the accurate figures the day after that 7 days traffic check tent fun finished. They even don't know how many thai are living on Phuket island if you give them 6 months to find out. Thai come and go from other provinces as it please them. "Where in the world are there people knowing it better than thai ? Nowhere.That is what they learn throughout their school years" Not surprised that such a stupid statement comes exactly from that megalomaniac expat who thinks he knows everything . That is thai cleverness :.." No reports of fatalities of 4 provinces"! 'No reports' doesn't mean that there were no fatalities. 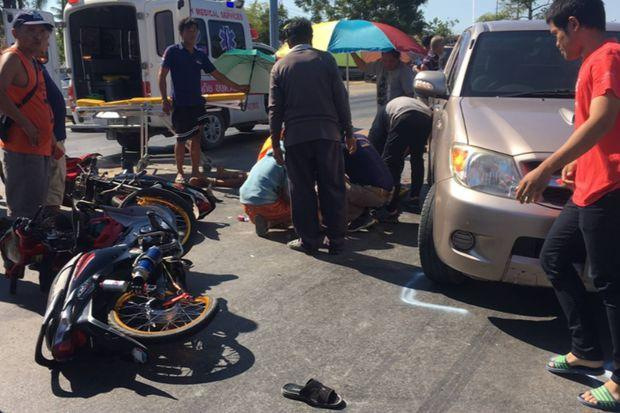 So now we have irrefutable proof that sitting in tents by the side of the road playing on phones doesn’t cut road deaths, will the authorities try a new approach for songkran? Learn from other countries perhaps?